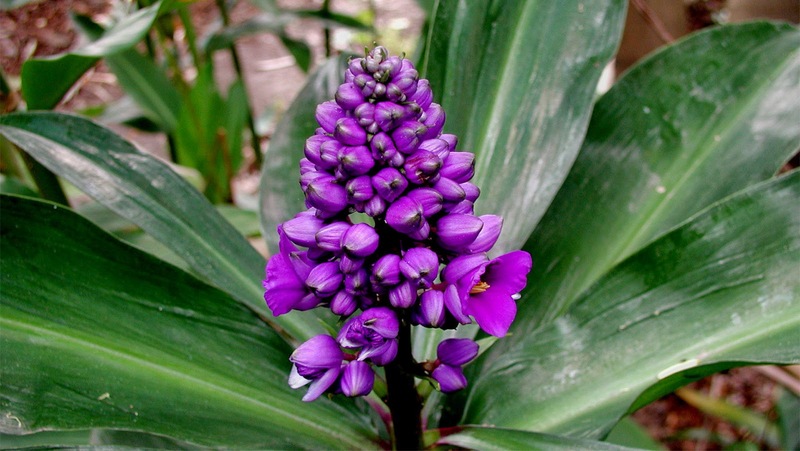 Dichorisandra thyrsiflora or Blue Ginger is a tropical plant which resembles ginger in growth and habit, but is actually related to the spiderworts (the genus Tradescantia). The plant is native to the tropical woodlands of North, Central and South America, specially in Atlantic Forest vegetation in Brazil. Of the family Commelinaceae, they are cultivated for their handsome spotted stems, large shiny foliage which is held horizontally, surmounted by striking blue flowers. The plant was first described by the naturalist Johann Christian Mikan in 1823. It was first grown in England in 1822, and is recorded from Sir William MacArthur's catalogue in 1857 of plants he grew in Camden southwest of Sydney. It has become naturalised in a small region of northeastern New South Wales in Australia. It is best grown in partial shade, sheltered from hot afternoon sun in summer and protected from strong winds that can damage the tall stems. It generally blooms in autumn. The beautiful clustered flower heads are vibrant purple-blue and appear atop of spiralled, ginger-like stems of leaves, which often have purplish undersides. It needs fertile soil and reasonable moisture in the warmer months. It is very frost sensitive. It is best to cut the stems back after flowering. It is propagated by division or root or stem cuttings. Me gustan fotos en el mundo. Such an original and beautiful flower ! Pretty plant! One more purple plant for the fall, I like blue and purple plants in the fall. Have not heard about Blue ginger, so now I wonder if what is commonly called ginger also has a bloom? Love the bright color of this one!